Dr. Tomáš Klvaňa is an outstanding journalist, scholar, researcher, and alumnus of the College of Liberal Arts, earning his doctorate in Speech Communication in 1997. He also holds an M.A. in Journalism from the Charles University in Prague (1992). In 2003 he was a Shorenstein Fellow at the Harvard University Kennedy School. Dr. Klvaňa currently works as the executive director of the Zdeněk Bakala Non-Profit Programs where, among other projects, he has overseen the establishment of the Aspen Institute partner in the Czech Republic. 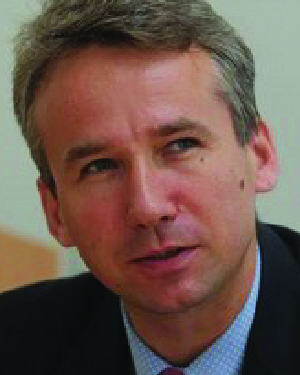 He serves as the vice-president of the Aspen Institute Prague Board of Directors. He is also a lecturer at the New York University in Prague. In 2003, Dr. Klvaňa worked as the press secretary and policy adviser for the President of the Czech Republic, and in 2007-08 as a Special Government Communications Envoy for the Missile Defense Program. In 2001-03 Dr. Klvaňa was deputy editor-in-chief of Hospodářské noviny (a leading Czech daily newspaper), and in 2000-01 a senior international affairs commentator for the Czech daily newspaper Mladá Fronta DNES. In 2011, Dr. Klvaňa published his literary debut, a novel, Marina. A Russian Story, in Czech (Marina. Ruský příběh. Paseka Publishing, Prague, 2011). Dr. Klvaňa serves on the Board of Directors of Economia Publishing, a leading Czech media organization, and also on the Board of the Harvard Club of Prague, and is a member of Czech Euroatlantic Council. He publishes a blog in Czech and analyzes international relations for leading Czech media. He frequently participates in international conferences. In 2005-06 and 2008-11 he worked in several managerial positions for British American Tobacco in Prague, Hamburg, London, and Brussels. Independently of his position, Dr. Klvaňa has acquired respect as an academic and has been invited often to give lectures and participate in various public forums dealing with international relations, security affairs, diplomacy and restoration of democracy. In naming Dr. Klvaňa a recipient of the 2012 Distinguished Leadership Award for Internationals, the selection committee cited his position and influence on public policy, public education in democracy, and international relations. He has performed all of these functions with diplomacy, tact, sophistication, and insight that has earned him a tremendously positive image and reputation.